Skybet are one of the UK's leading online bookmakers given their huge brand awareness as part of the Sky TV Group. You will need a Team Profit account to gain access to the calculator and earn £9-£15 profit. Everything on Team Profit is free, forever. Start by signing up to Betfair (if you do not yet have a Betfair account) using the below link. Then, sign up to Sky Bet and deposit £5 to receive the Bet £5 Get £20 offer. Note the minimum deposit using a bank card is £5 whereas Paypal is £10. Use a debit card rather than a credit card as when depositing using a credit card is considered a cash advance so you may incur a £3 fee from your credit card provider. Please treat Betfair as a 5% commission still in the calculator. As the offer still takes the 5% commission, but then refunds it as a free bet every 7 days. a) Choose a popular league or cup on Sky Bet. To make this even easier and faster, check the Selections blog where every week I select the best teams for your trigger and free bets. b) Choose team(s) above the 2.0 minimum odds on Sky Bet. 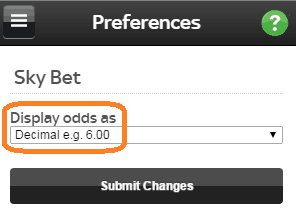 If you want to change between viewing your odds as decimals and fractions, go to the 'My Account' section once you're logged in and click on 'Edit Account Details' followed by 'Odds Format'. Enter £20 in the Calculator for the stake as you will be placing all 2 x £10 free bets on the same team. Use the Sky Bet free bet in the betslip. Repeat placing the £10 free bet to use both 2 x £10 Sky Bet free bets. Place your 2x£10 Skybet free bet. To use each free bet, just click 'Use Free Bet' in the betslip. For the Exchange lay bet, you only place this once. This is because you entered £20 into the calculator in Step 2 and so have both 2 x £10 free bets matched. Easy money! If your trigger bet or free bet won in Sky Bet, then withdraw these winnings.